This week we have drawn the Fire Card. It has to do with loss and rebirth of something in your life. It indicates that there is something in your life such as an old habit, acquaintance, or thought that is no longer serving you. It is most ideal if we can see this on our own and deal with deleting it ourselves, rather than having it “taken” from us. It is like when you learn to prune a rose bush. I found it difficult the first time to cut back those seemingly healthy branches to little stubs. But then when they start to regrow with a renewed vigor, you begin to understand the value of cutting off the old wood. Another analogy is when a forest is so dense that not very much light reaches the forest floor to feed new growth. Nature in her own way “prunes” by allowing a forest fire to open a pathway for more light reach down to the ground level. If something is “taken” from you this week, start looking right away for what will now be allowed to come in and fill that space. 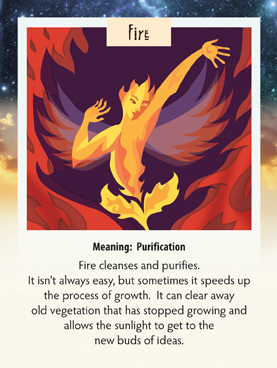 Look for the value of the cleansing that allows for new growth.